Santorini was filmed during April 2013 by dimid, a timelapse photographer from Minsk, Belarus, and his colleague Zweizwei from Korea. 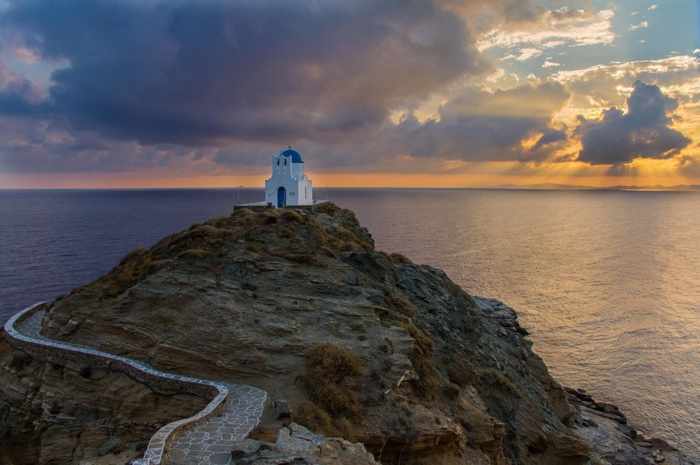 Bedazzling beauty: Now that it’s a brand-new year, people around the world are beginning to book their spring, summer and fall trips to Greece. Since many will be spending some time on Santorini, I’m posting some inspiring videos that may help them plan what to see — and perhaps even where to stay. The film at the top of this post is a gripping 2.5-minute timelapse video that highlights some of the island’s superlative scenery, and shows why Santorini is not only one of the most popular destinations in Greece, but also one of its most well-known islands worldwide. The video above was produced by Expedia several years ago to accompany its Santorini Vacation Travel Guide, but its images are timeless. 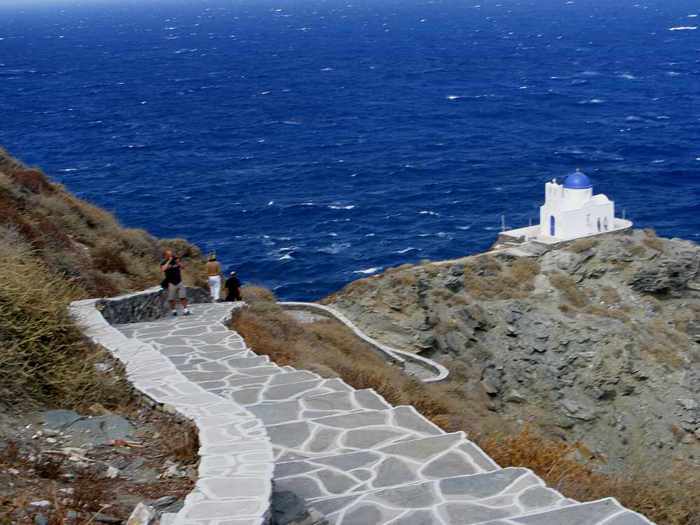 Slightly more than 5 minutes long, the film features many of the island’s renowned sunset and caldera views, but also shows some of Santorini’s stunning beaches and coastal scenery. The video below is over 15 minutes long and it, too, showcases the enticing views and mesmerizing scenery that enthrall the nearly two million people who visit the island each year. 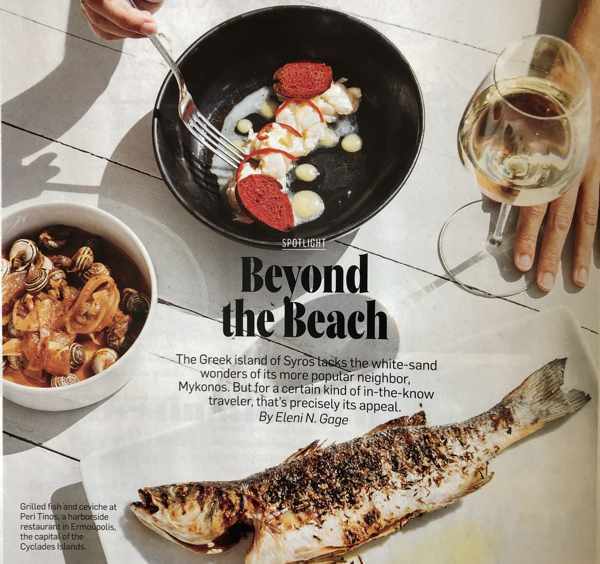 But it also spotlights many of the island’s most popular places to stay, dine and drink, and demonstrates how dozens of Santorini’s cliff-edge hotels, infinity swimming pools, bars and restaurants look as luscious as the surrounding natural landscapes and seascapes. And if you’re still trying to decide where to stay and dine during your trip, this video could help you narrow your options — signs for many of the resorts and restaurants can be seen in the film. Enjoy the amazing views, and happy planning! Eye & camera candy: If you enjoy exploring Greek island towns, either simply to stroll around and just see what’s there, to learn more about the destination’s history, or to discover interesting subjects for photography, painting or other artistic hobbies, you won’t be disappointed with Andros Town. 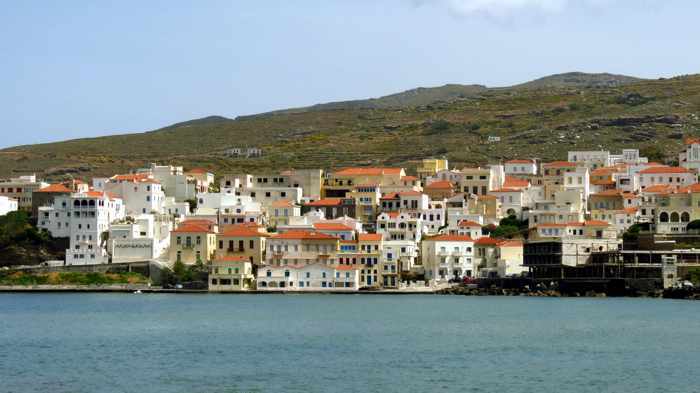 During our Andros visit this spring, we spent three days at Chora (the Greek name for the island’s main town) and wandered its streets, lanes, and seaside areas several times. 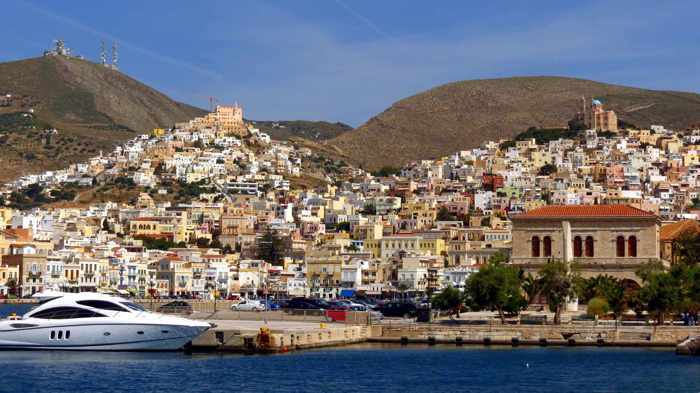 The town has many familiar features and amenities we enjoy seeing and photographing on other Greek islands — outdoor bars and cafes, public squares, picturesque churches and chapels, impressive local architecture, and cats aplenty — but it also boasts its own special landmarks and historic sites, plus distinctive natural surroundings of seasides, beaches, bays and mountains. Unfortunately, jet lag kept us from exploring Andros Town as thoroughly as we would have liked. Though we did view a lot of interesting sights and scenery, when it came time to move to a beach resort area on the south side of the island, we realized there had been much, much more we didn’t get to see. But that just means there will be plenty of new things to experience the next time we visit Chora. Page 2 of this post features photo slideshows of some of the sights we saw during our various walkabouts. Click here or on the link below to access the photos. You can view full-size versions of all of the pictures, along with hundreds more, in our Andros Town album on the mygreecetravelblog Flickr page. 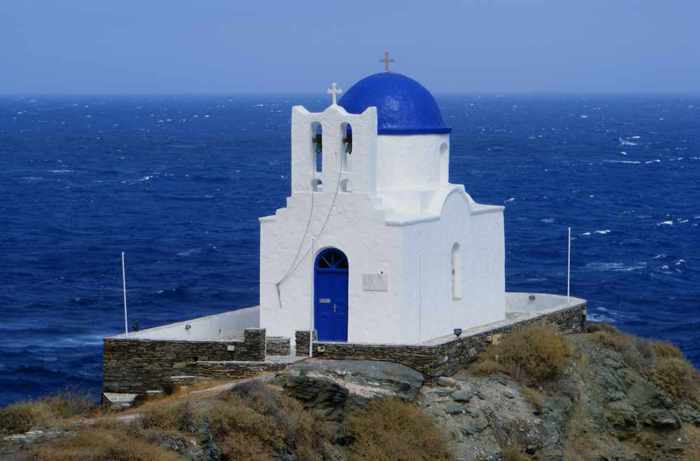 Windswept wonder: We have seen hundreds if not thousands of blue-domed churches in Greece, but the Chapel of the 7 Martyrs on Sifnos easily ranks as one of the most memorable. 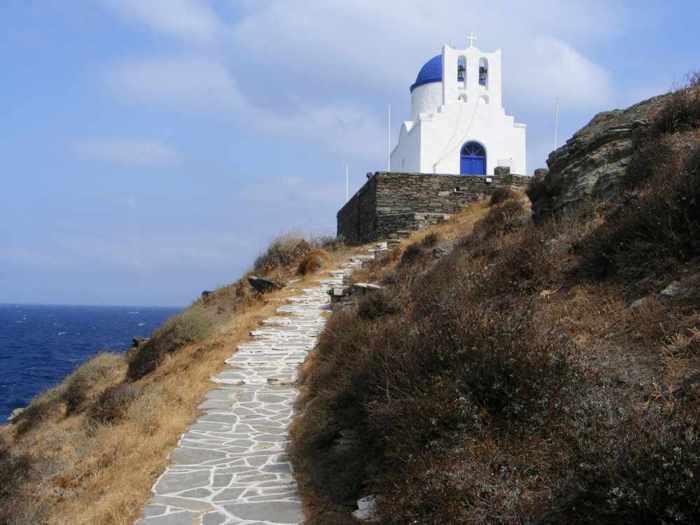 We got to see it during a four-day visit to Sifnos in late September 2007, and were practically blown away by the experience — and not just because the chapel is such an impressive sight. 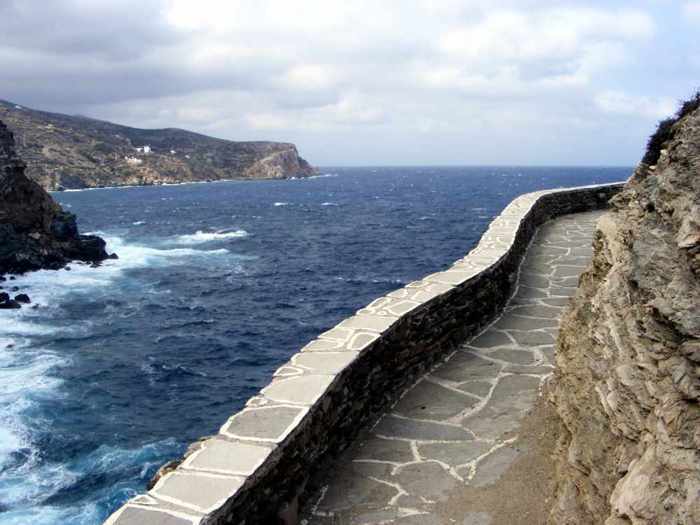 It was warm and sunny when we arrived at Sifnos on a Friday afternoon, but conditions changed abruptly. Within less than two hours, near gale-force winds began blowing, followed overnight by thick, dark stormclouds and periods of light rain. The gusts were so strong that rough seas forced the cancellation of ferry service for the next three days. But we didn’t let the unrelenting wind stop us from sightseeing. Occasional breaks in the cloudcover motivated us to get out and explore, and we spent one day hiking to the villages of Artemonas, Apollonia, Kato Petali and Kastro. We got our first glimpse of the Chapel of the 7 Martyrs while following a clifftop footpath that winds along the the east side of Kastro, about 90 meters above the sea. 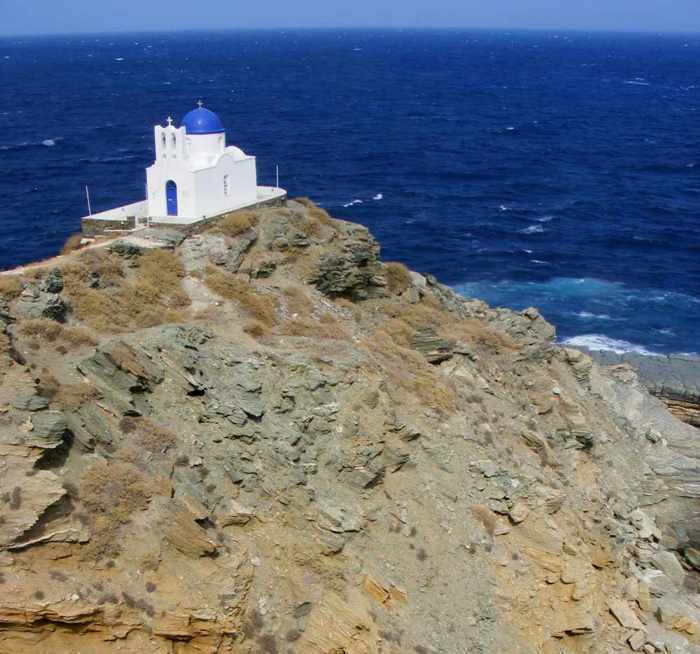 It was breathtaking to look down and suddenly see the whitewashed, blue-domed church far below, perched atop a rugged, rocky peninsula that juts into the Aegean. We saw a group of tourists making their way down a twisting, stone-paved path that leads to the church, and decided to make the trek as well. But the blasting winds actually stopped us in our tracks a few times, and more than once nearly blew us off balance. When one particularly strong gust nearly knocked down a woman walking behind me, she and her companions turned back, saying they felt it was too dangerous to venture any further. But we plodded on, climbing down dozens of steps and then up a short hillside to reach the church. The wind was even worse here, but we couldn’t go inside the church to escape it because the door was locked (apparently the chapel is open only several times a year for special occasions and feast days.) It was almost impossible to hold our cameras steady to take photos, even on the south side of the building where the wind was partially blocked. In fact, the blustery conditions were so unpleasant we stayed only a couple of minutes to view the coastal scenery before making a hasty climb back to the sheltered lanes in Kastro. Despite the inclement conditions, it was well worth braving the elements to briefly see the chapel. If anything, the wind and the surrounding whitecapped sea gave the Chapel of the 7 Martyrs even more of an exhilarating “wow” factor. Below are several more of our own photos of the church. You can see full-size versions of them, along with 20 additional images, in my Chapel of the 7 Martyrs album on Flickr. At the bottom of the post are two wonderful pictures of the chapel that were shot by photographers from France and Greece. 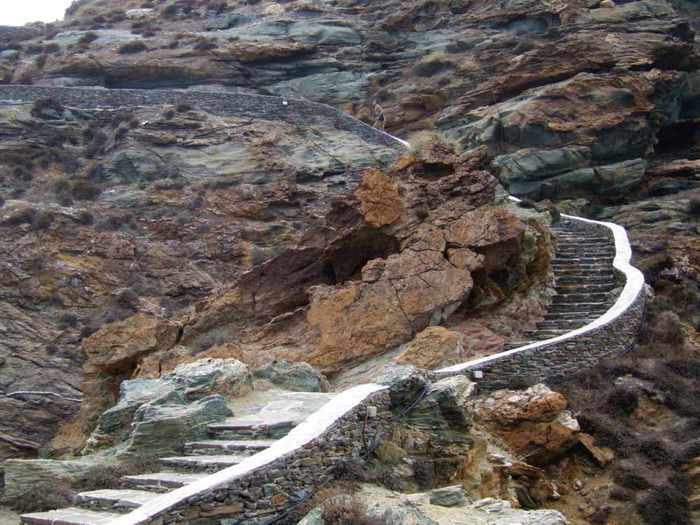 After descending dozens of steps, visitors face a short uphill climb to the chapel. 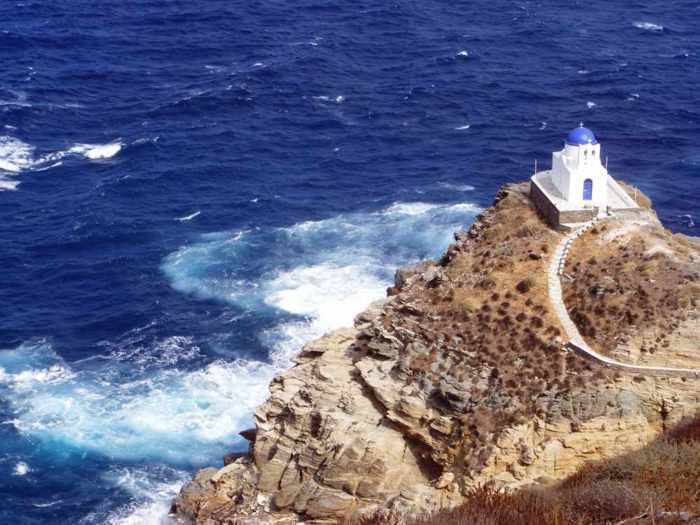 A terrace that wraps around the church offers amazing views of the sea, the Sifnos coast and Kastro village, but we weren’t able to enjoy the scenery because of the high winds. A view of the Chapel of the 7 Martyrs in weather conditions even more severe than we experienced. 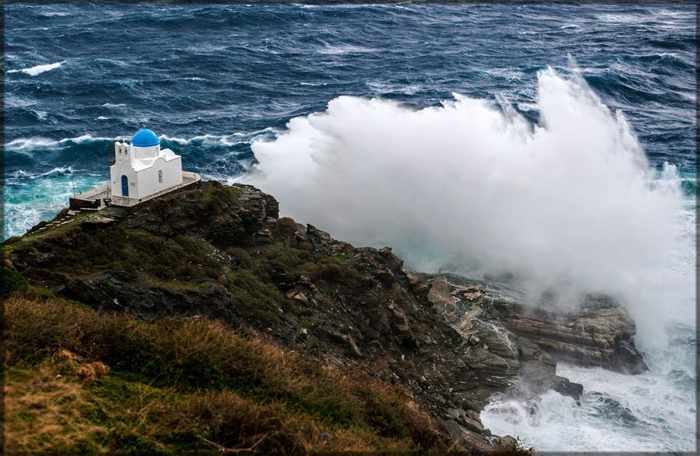 This image, which has been widely circulated in social media, was captured by Sifnos photographer Giannis Kontos. Another image that has been shared extensively on social media is this sunset view of the chapel, shot by photographer Charly Lataste.